We argue that the recommendations made by the Institute of Medicine’s 2011 report, Chimpanzees in Biomedical and Behavioral Research: Assessing the Necessity, are methodologically and ethically confused. We argue that a proper understanding of evolution and complexity theory in terms of the science and ethics of using chimpanzees in biomedical research would have had led the committee to recommend not merely limiting but eliminating the use of chimpanzees in biomedical research. Specifically, we argue that a proper understanding of the difference between the gross level of examination of species and examinations on finer levels can shed light on important methodological and ethical inconsistencies leading to ignorance of potentially unethical practices and policies regarding the use of animals in scientific research. Jones, R. C., & Greek, R. (2014). 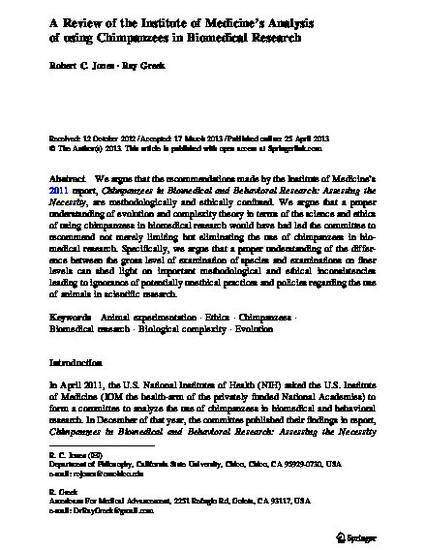 A review of the Institute of Medicine’s analysis of using chimpanzees in biomedical research. Science and engineering ethics, 20(2), 481.